Come prepared for the Dependability and Safety Instrument (DSI) with JobTestPrep's sample questions, evaluation criteria, and information about companies using the DSI test as a pre-employment screening assessment. Use this PrepPack™ to give yourself the best chance of success in the DSI test. Containing one full-length practise test, personality profiling test-lets and free our access to our interview preparation application we are sure you will be happy with this pack. Looking forward to having you on board. The DSI test is used by employers to measure behavioural characteristics in candidates that will predict their dependability in the workplace. The DSI consists of an 18-question online test that can determine a candidate's attendance rates, adherence to company procedures, and level of risky behaviour. The test usually takes candidates seven minutes to complete. See the figure below for DSI sample questions. Administering the Dependability and Safety questionnaire is often a company's first step in screening candidates during the recruitment process. Read on and learn about expert tips addressing how to come prepared for the critical DSI test. What Is Dependability in the Workplace? Each category explains the behaviours that an ideal candidate would demonstrate in the workplace. Continue reading to learn how each of these categories is reflected in DSI questions. What Should I Expect to See on the DSI Test? 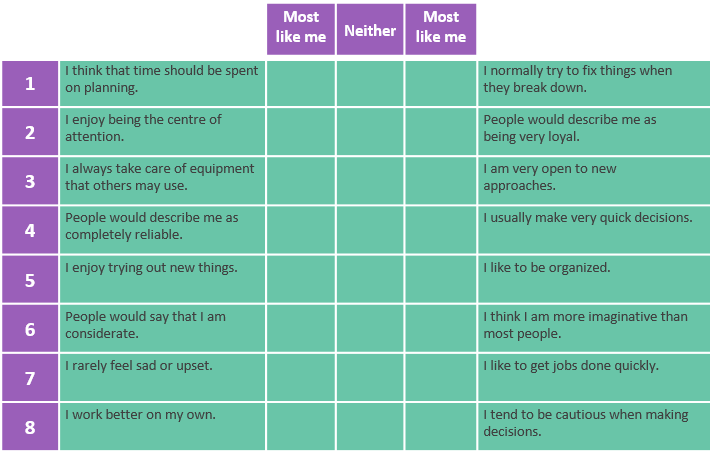 The Dependability and Safety questionnaire evaluates your pre-existing personality and behavioural traits. During the test, you are asked to read a series of paired descriptive statements and then to choose which of the two best describes you. If you read through the DSI's evaluation criteria, you will notice which of the statements above represent dependable and safe values. For example, in the seventh statement pair, the first statement, 'I rarely feel sad or upset' reflects a candidate's ability to maintain an even temper. However, the second statement in the pair, 'I like to get jobs done quickly' demonstrates that a candidate would prefer to accomplish something quickly without paying close attention to detail and quality. Therefore, the first statement in the pair reflects a low-risk candidate that is suitable for a strict work environment, unlike the second statement in the pair. Continue reading to learn about how DSI tests are evaluated by employers. Did you know?The statements are arranged in pairs because research shows that forced-choice scoring decreases the chance that candidates will attempt to project a personality that is more suitable for the job. How is the DSI Test Scored? In the retail and call centre sectors, high-scoring candidates are about twice as likely to be the most productive workers and are twice as likely to receive high customer service rankings. In the manufacturing sector, high-scoring candidates are perceived by their managers to be three to four times safer than their co-workers. The Dependability and Safety questionnaire is a brief yet critical step in the employment process because it is meant to ensure that only the most productive, safe, and reliable candidates will move forward. JobTestPrep is working on developing a DSI practise test to help you best prepare for the questionnaire. CEB, Gartner, SHL, DSI, and other trademarks are the property of their respective trademark holders. None of the trademark holders is affiliated with JobTestPrep or this website.